When T-Mobile, the nation’s fourth-largest wireless carrier, started selling the iPhone 5 back in April, it offered the iconic smartphone for $99 down payment and 24 monthly payments of $20 to cover the full cost of the phone. 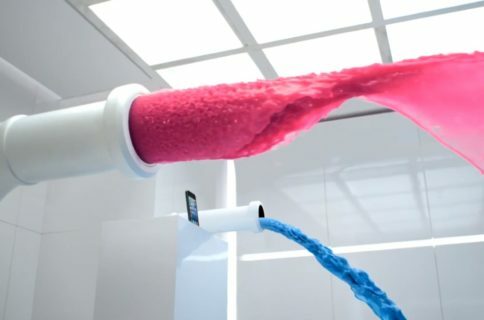 And in an effort to push the device and lure would-be consumers into signing up, the Deutsche Telekom-owned telco last weekend started offering the device for the $0 down payment, with trade-in. Unfortunately, the launch promotion for new users has ended now. 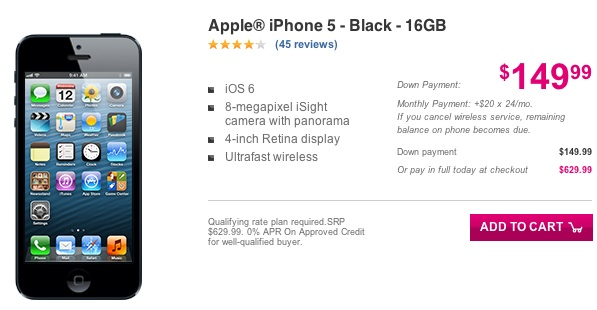 As a result, the 16GB iPhone 5 now has a $149 payment, $50 more than before. Wait, the $99 down thing was actually a promo offer? As you can see for yourself on T-Mobile’s web store, the handset is still being offered with the same 24 monthly payments of $20 – “only” the down payment requirement has changed. As TMoNews points out, the carrier did not make it clear that the $99 price was only good for one month. Be that as it may, the additional $50 in down payment increases total cost of ownership for the 16GB iPhone 5 to $629 from $579. That’s actually just twenty bucks cheaper than Apple’s asking prices for unlocked iPhone 5 units, although Apple doesn’t currently offer the monthly payment option to U.S. customers. The 32GB/64GB models now have $249/$349 down payments over at T-Mobile, respectively. If you though about jumping ship and are willing to trade in your old iPhone 4/4S, you should take advantage of T-Mobile’s Mother’s Day promotion. Depending on the trade-in value of your iPhone 4/4S, you can use credits towards both the down payment on an iPhone while also decreasing your monthly payment requirement from $20 to $15. As for the new $149 down payment requirement, that’s very Uncarrier, indeed. At least T-Mobile should have made it clear from the onset that the $99 down payment would only last during the “promotional” launch period.